As May passes, I'm starting to think about our plans for the summer and next year. Last year at this time I was planning for kindergarten for Tiny B at the charter homeschool (and knowing that she was NOT ready--if she had not been so premature she wouldn't be in kindergarten the upcoming year) and I was up to my ears in anxiety over the fact that she wasn't eating orally at all and her migraines were being made worse by the constant tube feeds with the formula. I was planning on my son not being able to attend any sort of preschool. Three months later, Tiny B was off her feeding tube and starting her wean, I was able to convince the charter homeschool that she needed to enter transitional kinder instead of kindergarten, and my son was able to attend two mornings of preschool a week! God really turned things around in a total display of miracles and love for us. This year, I am not unsettled about anything regarding the kiddos and I'm looking forward to next year, where Tiny B will enter kindergarten and attend the charter homeschool two days a week. Strong B will be home with me every day and won't attend a preschool. He'll be doing Mother Goose Time with me and Tiny B, and I couldn't be more excited or confident. I feel so blessed that God has provided this opportunity for me to blog for MGT and receive the curriculum, and I am so confident that Strong B will be provided ample opportunities to learn the preschool objectives, as well as learning the love of knowledge and education. I've learned that a gigantic part of being a mom is making minute by minute choices for your children and doing your best in these choices. Some choices might seem "different" to others, such as weaning Tiny B off of her feeding tube with a team of doctors a world away in Austria and over the Internet. But I felt that tug in my heart to do it, and I think that all moms have that tug. I also feel that tug to stop doing certain things that I'm doing, such as sending Strong B to this amazing preschool (that I love!) two mornings a week. We are a one car family and our scheduling needs to change next year, and God has placed this sense of calm within my heart, that I am doing what He wants me to do. Every day I find ways in which I think I'm failing as a mom, but I think that it's the current culture that is causing many of us to feel this way. I think that we just need to continue listening to those tugs (often times the Holy Spirit) and our kids will be okay. I'm counting the days until I attend a homeschool conference next month, where I will attend lots of classes and rest in my very own hotel room where I will plan and daydream about next year, and probably eat way too many cookies. Last year my time at this convention was amazing, and it was almost as amazing to spend the time alone in my room, without having to meet little people's needs. I never understood just how hard being a mom was. 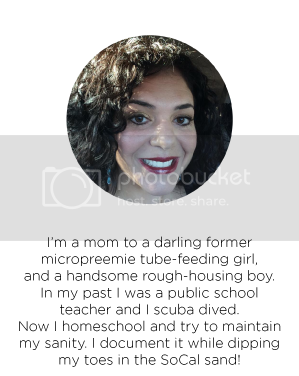 I taught for ten years, having hundreds and hundreds of parent-teacher conferences, while having absolutely no idea what the moms across the table from me were feeling. If I were to go back to it, I'd be different, for sure. My mom is a mom who has loved me unconditionally my entire life, even when I was a big jerk to her. She still has such empathy for me and what we have gone through over the last six years. 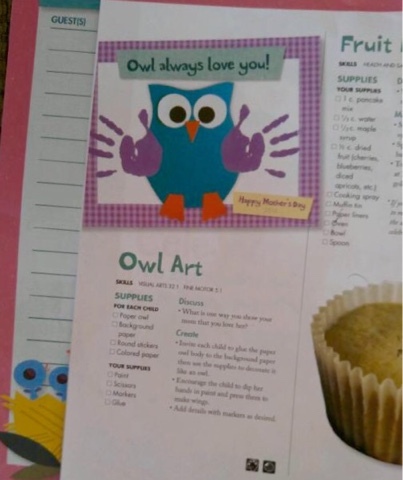 So when Mother Goose Time included an art project in their Mother's Day kit that came with the month's curriculum, I knew that the project was meant for my mom, and not for me. 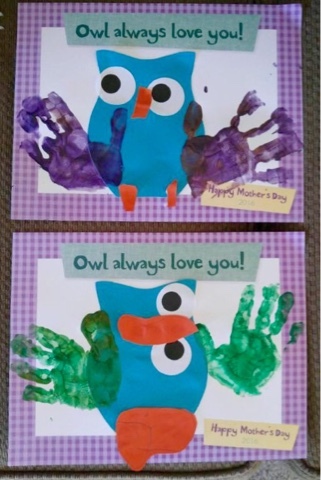 The owl was pre-cut, but I had the kids do everything else themselves. I love how Stong B's is so different. He wanted it to look different. Isn't that funny, that even a 3 year-old wants to be original? Tiny B was not happy that her brother didn't want to put the parts in the correct position, but hopefully we were able to show her the fun of originality. My mom adored the art and insisted that I laminate it. The kids handed it to her as they walked through her door and surprised her. I was watching through the window and I will never forgot the look of sheer joy in her face as she saw them. Please excuse my blurry pictures. I still haven't gotten a new phone (pure laziness!) and it is full, meaning that I have to take pics with my husband's phone and text it to myself. One of the many things that I'd love to change about myself in this phase of life is that I get lazy...I don't get everything done that I should. Maybe this mama will start to get better at this as Tiny B's needs become less. Being a mom is oh so tiring, but also beautiful.